Fifty years ago this week, flash floods left Cranleigh High Street underwater and severely disrupted the beginning of the 1968 Michaelmas Term. It is estimated almost four inches of rain fell in under 36 hours, water started pouring off Winterfold into the Village. It was moving with such force that it bowled over firemen trying to head up the Ewhurst Road, and by the Monday afternoon Cranleigh High Street was left up to a foot underwater. The cinema was completely flooded, as were the cellars of Tylers where all the labels came off the wine. The bottles – and detached labels – were rescued and over the next few weeks the labels were glued back onto bottles in a rather haphazard way. No customers complained. The Sunday was the first day of term but fewer than half the boys made it back, not least because Horseshoe Lane carried a torrent of water over a foot deep. The CCF then had a Naval Section and its rubber dinghy was called into service to enable people to reach premises in High Street. Water poured straight through St Joseph’s School in Amlets Lane, in at the back doors and out of the front, and its cellars were full. The masters also struggled. David Emms, the headmaster, opened a meeting of the staff at 3pm on the Sunday by thanking those “who had managed to make it through to the School”. Many Cranleigh parents had scary experiences, and those who got through were often soaked to the skin. Clothing was lent to parents who succeeded and then had to drive home. It was several days before all boys were present. 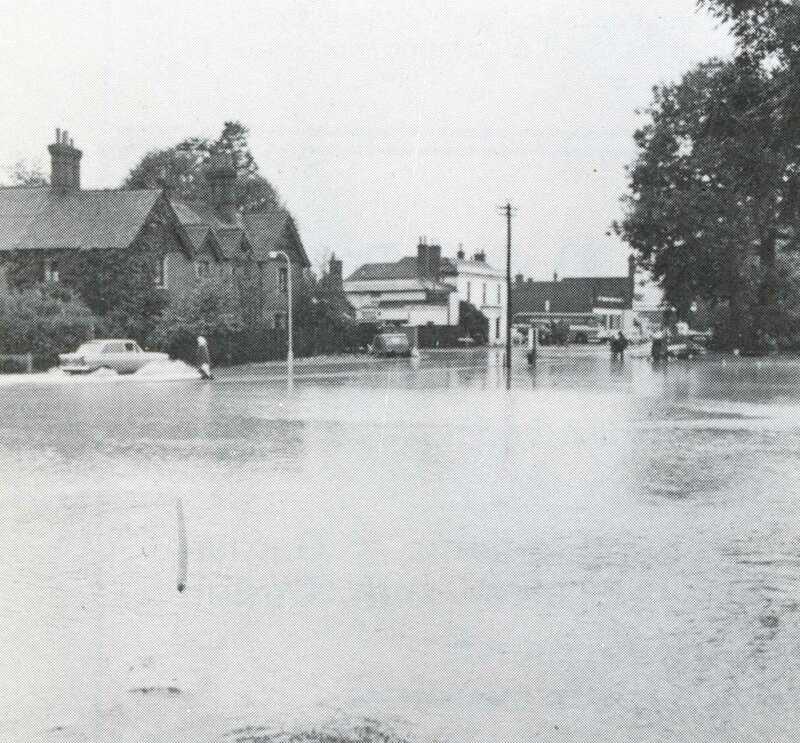 This was not the first time Cranleigh had suffered major flooding but it resulted in a complete overhaul of the village’s drainage. 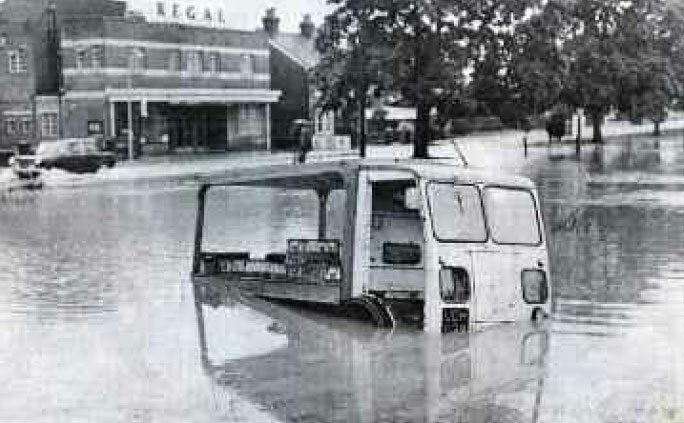 In the coming days there were floods across much of Surrey. In Guildford the River Wey burst its banks in many places creating havoc to thousands of homes and businesses all along the valley. By Monday water was six feet deep in places. 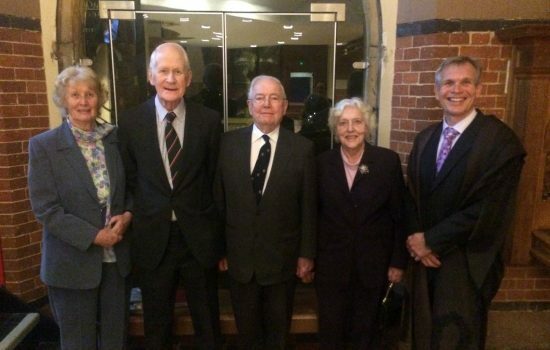 As in Cranleigh inflatable boats rescued people stranded in their homes. Plummers Department Store (now Debenhams), which had only been open a year, had its basement completely flooded and the ground floor was under three feet of water. The fire brigade had their work cut out pumping five million gallons of water from the building. The furnishing store Court Bros suffered losses of over .15,000, with the Surrey Advertiser reporting that the manager boated in through a broken window to see furniture and crockery floating about, wallpaper peeling off, rolls of wet carpet and everything covered in a layer of silt.